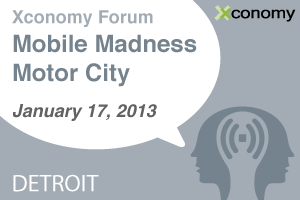 Now that the hustle and bustle of the holidays is over, we’re getting pretty excited for Mobile Madness Motor City, Xconomy’s inaugural mobile event in Detroit. The half-day forum is packed with some of southeast Michigan’s top technology innovators tackling Michigan’s growing mobile scene and the many ways mobile is revolutionizing the way we live, work, and play. You can still get tickets for this special event, which runs from 2 p.m. to 5:30 p.m. at the Compuware World Headquarters in downtown Detroit, with loads of networking time during and after the event. We’ve got tickets at a special sale price available for a few more days, so register now. And if you’re a student or working at a startup, make sure you check out our steep discounts. This is the first year we’re hosting Mobile Madness in Detroit after four years of running it in Boston, where it’s become a wildly popular event. In this way, and with a special live demonstration of wireless charging (of everything from your devices to electric cars) from Boston-based WiTricity CEO Eric Giler, this conference truly highlights our ability to connect ideas and people from innovation centers around the country—a key part of Xconomy’s mission as we bring you news from our six-city network. Detroit is the city that put the world on wheels, and our “Car Talk: Your Car Here, Now, and Soon” panel discussion highlights how the Motor City remains on the cutting edge of auto innovation. Daniel Newman, CEO of Roximity; Jake Sigal, CEO of Livio Connect; and Greg Ross, director of business development for General Motors, will participate in the discussion moderated by Joel Hoffman, an automotive strategist with Intel. In a separate presentation, Sheryl Connelly, Ford’s manager of global trends and futuring, will discuss three trends that will change the world. We’ll hear from other top players in Michigan’s mobile space, including Josh Linkner of Detroit Venture Partners; Paul Czarnik, Compuware‘s Chief Technology Officer; Dug Song of Duo Security; Sagar Parvataneni of ePrize; Detroit Labs‘ Paul Glomski; and many others. We’ll also hear from startups and industry veterans, and we’ll even have a cool live demo from Eric Giler, CEO of WiTricity. Of course, with all of this expertise and excitement in one room, we’ll also offer an unparalleled networking opportunity to our attendees. Check out the full agenda below, and make sure to get your tickets now to lock in the best price. We’ll see you Jan. 17.